I never eat Tootsie Roll Pops unless a) I’m desperate and b) it’s the only candy around. 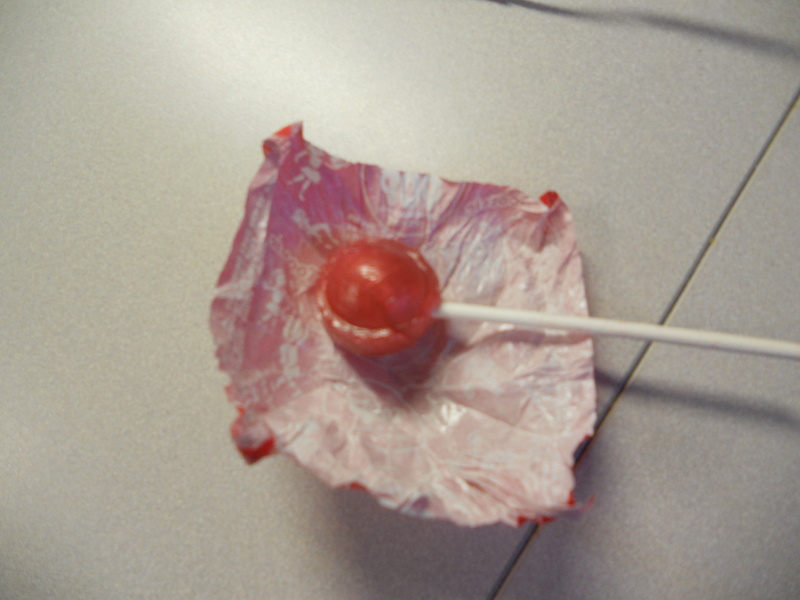 One of my co-workers keeps a Tootsie Roll Pop “bouquet” in a mug perched on her cube wall; I’ve walked by that mug every day for 5 years and never taken one candy “flower.” I wasn’t even hungry when I grabbed the orange Tootsie Pop and unwrapped it last Friday night at the office. As I finished what I was doing in my cube, I thought back to the Tootsie Roll Pop commercials from the 1970’s. My sweet-tooth was not pleased when I crunched into the Tootsie Roll candy center while driving out of The Big Corporation’s parking lot. I had barely gone 200 yards when I felt a piece of something that wasn’t a Tootsie Roll in my mouth. The crown on my left lower molar was lodged in the candy center. I pulled over and examined the crown. I wasn’t in any pain and I could put the crown back into place. I left a message with my dentist and knew he’d make time for me on Monday or Tuesday. There is research to suggest that dental decay and cavities (caries) are caused partly by excess sugars left on teeth. Some dental researchers have intimated modern processed foods increase the likelihood of decay. I’ve discussed this issue with my dentist and he always stresses the importance of brushing and flossing after meals and snacks so that food and sugars aren’t left on the tooth surface for long periods of time. Don’t get me wrong; I’m not one of those people who fear the dental chair; I can recline and catch a 20 minute cat nap while I get my teeth cleaned. My dentist is outstanding. I’ve been his patient since 1988. Finding a good dentist can be a painful process (literally), so I’ve made the trip to Portland, Maine for the last 12 years instead of going to a local and potentially disappointing dentist. I don’t mind making the commute to Portland for a snooze in the dental chair and a chat with Dr. Iselborn; I just hadn’t planned on going this week. The orange Tootsie Roll Pop changed everything. Other people have warned me about hard candy. My mother has lectured me on numerous occasions about the dangers of caramel, taffy, mysterious chocolate-covered substances, almonds, cough lozenges, and popcorn kernels. These things are the enemy of the middle-aged tooth. I can almost hear her voice in my mind’s ear right now. She was right, once again. It’s hard to know whether cavities, disease, and death will be eradicated in the future. When I have occasion to view the Tee Vee, the news puppets certainly do have bright, shiny teeth. A person might even be blinded by their dental brilliance as they announce the dawning of a new era of health, vitality, and eternal life. Since I have a few reasons to go to Maine today, I’ll work a side trip to the dentist into my schedule. It could have been worse; I could have swallowed the crown! That would have been a troubling problem. Just to be on the safe side, though, I’m going to knock it off on the Tootsie Roll Pops from now on. It doesn’t really matter how many licks it takes to get to the Tootsie Roll Center of a Tootsie Pop, does it? This entry was posted in Cooking and Food and tagged dental health, dentists, eternal life, Tee Vee, Tootsie Roll Pops, Weston Price. Bookmark the permalink.